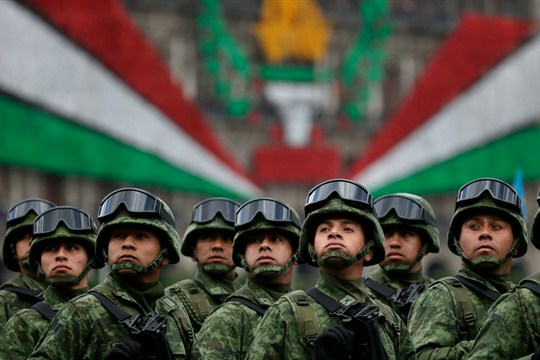 Mexican soldiers look up toward President Enrique Pena Nieto as they ride past the National Palace during the annual Independence Day military parade, Mexico City, Sept. 16, 2016 (AP photo by Rebecca Blackwell). In the middle of the night on June 29, 2014, the Mexican army massacred 22 civilians in a grain warehouse in the small town of Tlatlaya in central Mexico. The government claimed the soldiers had been attacked by members of a drug cartel and had opened fire to protect themselves. But witnesses and journalists told a different story. There was little evidence of a prolonged shootout, and Clara Gomez, whose 15-year old daughter was one of the victims, testified in court that she and other survivors had been tortured into backing the government’s version of events.